Wells used for irrigation, when they have a significant amount of iron, are among the biggest challenges in water treatment. Iron stains on walkways and buildings are an aesthetic nuisance. Although there are chemicals to remove stains, cleaning driveways, sidewalks, and buildings is no fun. The difficulty with removing iron from irrigation wells has to do with the amount of water needed and the duration of the irrigation cycle. 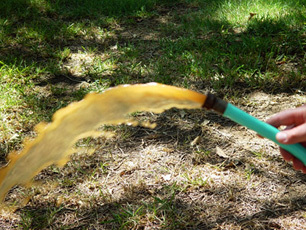 An iron filter for regular household use in a residence has only to process a few hundred gallons of water before it is allowed to clean itself by backwashing. The backwash typically takes place at night when there is no demand for filtered water. An irrigation system, on the other hand, may be required to run for hours on end, and unless an elaborate system of multiple filters and sophisticated electronic controls is provided, the filter is usually overwhelmed with iron before a backwash can take place. Failure to backwash in a timely way not only allows iron to bleed through the filter but can damage the unit itself. A frequent compromise for irrigation systems is not to attempt to filter out the iron but to inject polyphosphate to "sequester" the iron so that it will not stick to driveways and buildings. Because of the cost and complexity of large capacity iron filters, this is what we usually recommend. Our friend and customer Brian Hoffman who lives in a small North Texas town, however, disregarded our advice and created an extremely effective iron removal system for his irrigation well. He started a few years ago with a single 10" X 54" birm filter and kept experimenting and adding until he got exactly what he wanted. I should explain that Brian isn't dealing with a small amount of iron. Our recent test found over thirty parts per million iron in the raw well water. That's 100 times what is considered an acceptable level of iron in water for household use. Brian's iron removal system now consists of an aeration tank to oxidize the iron, calcite filtration to raise the pH of the water and to filter out the iron in the same operation, and, finally, a birm filter to polish off any iron remaining. The product water is stored in a 2,500 gallon storage tank before it is sent to his lawn. This treatment reduces the iron level from 32.3 ppm to 0.19 ppm. His driveway and sidewalks show no trace of iron staining. We recently visited Brian's treatment plant and took some pictures. The pictures shown were taken on a 100˚ plus Texas August afternoon. The whole treatment system is located in Brian's shady (and well-watered) back yard. The main treatment components consist of the four almond colored 10" x 54" tanks in the foreground. 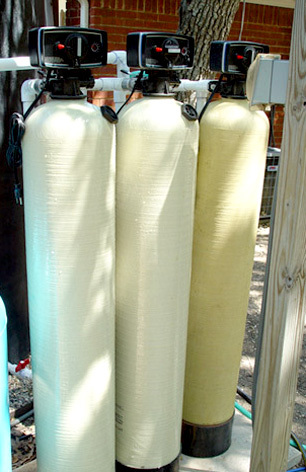 These are, from left to right, the aeration tank of the AerMax system, two calcite filters, and a birm filter. The larger blue tank is the pressure tank for the well and the smaller blue tank is the pressure tank for the outdoor delivery system. The big, black tank in the background stores 2,500 gallons of processed water, ready to be pumped to thirsty plants. 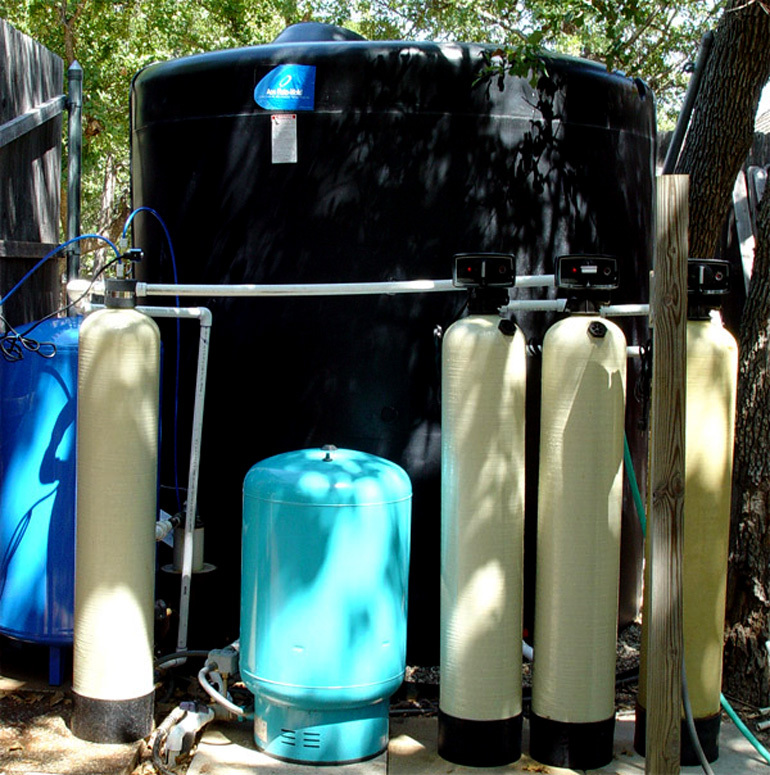 The three-tank filter system. All three filters are controlled by Fleck 5600 heads. Note that the calcite filters have dome holes to make adding calcite easy. Brian also uses the easily removable caps for visual inspection of the inside of the filters. Brian initially added calcite to raise the pH, which was in the 6.5 area, but was pleasantly surprised to find that the calcite itself serves as a great iron filter. 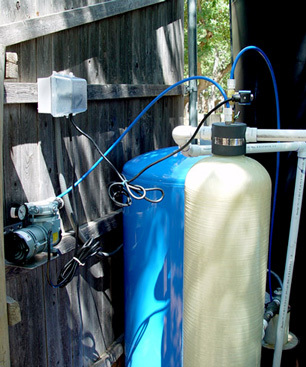 The air pump at left (mounted to the fence) feeds air into the almond aeration tank via the leftmost blue tube. The blue tube on the right is the drain line from the Maxi Vent, which releases excess air and water. Brian recycles the drain water by sending it back into the well. For closeups of pump and tank, go here. More information on the AerMax System here. Backwash water from the first calcite filter. This filter gets the bulk of the iron and requires frequent backwashing. The two remaining filters catch what's left. The success of this system is not just the filters. The 2500 gallon storage tank with a repressurization pump allows controlled production of a fixed amount water for use at a later time. Another essential ingredient of this system's success is work. Brian will tell you that this is a labor-intensive system. It could be made easier with greater reliance on electronic controls, but that would be a lot less fun. AerMax Aeration Systems Closeups of pump and tank.